The increase starts this April. The first wave of the increase in Social Security System's monthly contributions begins this month. From 11%, Social Security System (SSS) contributions will now amount to 12% of the individual's salary with the employers shelling out more than the employees. The agency plans to increase monthly contributions to 15% by the year 2025 to make sure SSS is funded until 2045. SSS justified this year's one-percent increase in premium payments by saying it will help its members save more for retirement. The agency also adjusted the minimum and maximum monthly salary credits. (Monthly salary credit or MSC means the compensation base for contributions and benefits related to your total earnings for the month.) The maximum covered earnings or compensation was previously P16,000, which has now been set at P20,000 (the minimum is P2,000 from P1,000). Newly appointed SSS chair Aurora Cruz Ignacio told CNN Philippines that the increase will allow members to apply for a higher amount of benefits and loan privileges. 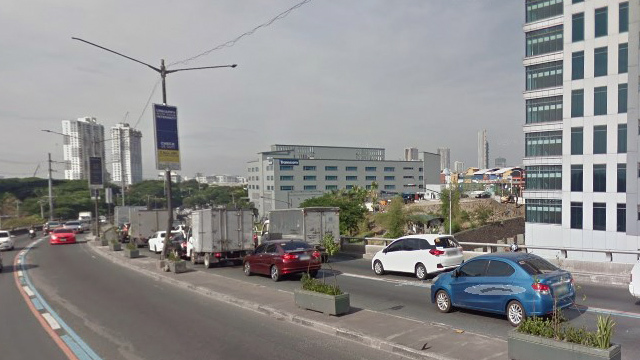 An employee earning P20,000 a month will now enjoy a Php600 sickness benefit—that's P120 more based on the previously allowed sickness benefit of P480 when the employee's MSC was just at P16,000. 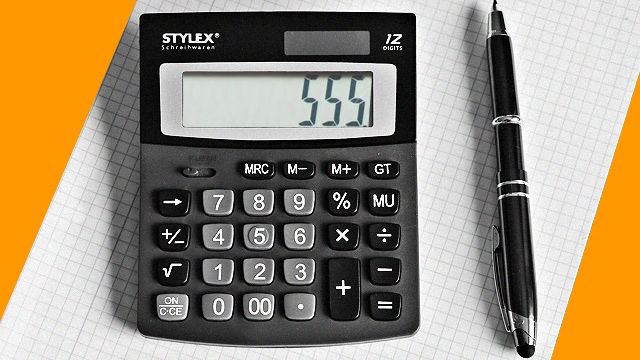 The employee's monthly basic pension when he retires also increases from P6,400 to P8,000. New benefits such as pension hikes, unemployment insurance, and expanded maternity leave benefits are all set to be implemented by the SSS. 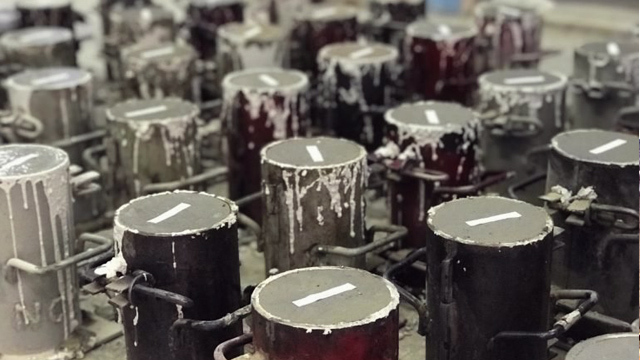 The increase in contributions was announced at the start of the 2019. On April 1, the agency shared an infographic of the breakdown for the new SSS contributions on their social media pages. Range of compensation is an employee's basic salary or a kasambahay's basic salary. MSC is the total SSS contribution shared by employees and employers. When you apply for a loan or a benefit, SSS uses this bracket to determine how much you are entitled to. SS Contribution-ER is the employer's share in the total Social Security (SS) Contribution. SS Contribution-EE is the employee's share in the total Social Security (SS) Contribution. EC Contribution amounts to P10 and is solely paid for by the employer. EC stands for Employee's Compensation Program, which is a fund for work-connected injury, sickness, disability and death with cash income benefit, medical, rehabilitation, and related services. 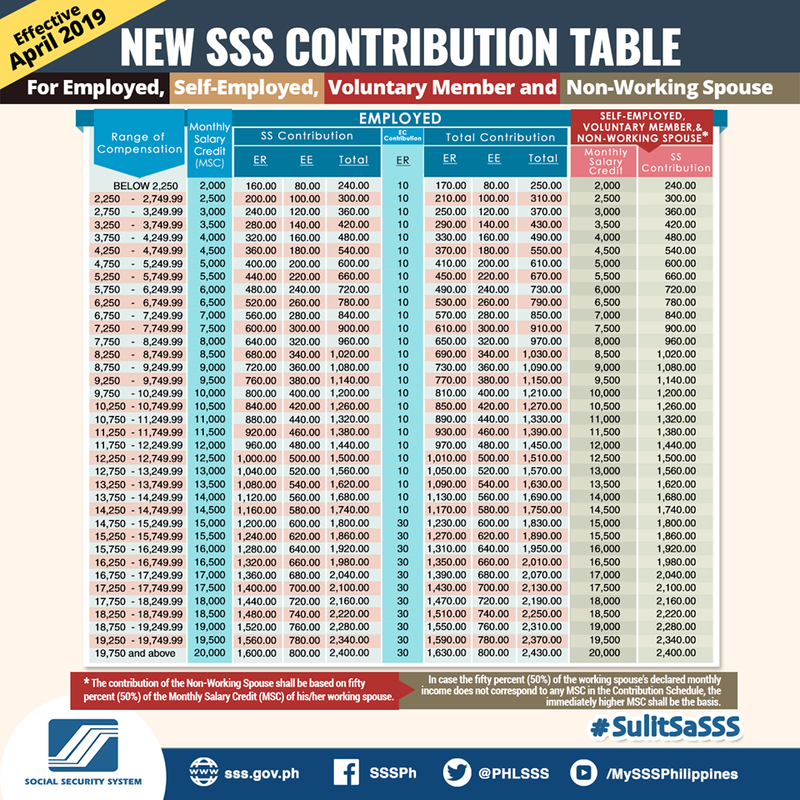 The actual total additional amount for SSS contributions will depend on your base salary. Employers will shoulder 8% of the 12% monthly contribution while the remaining 4% will be deducted from the employee's salary. 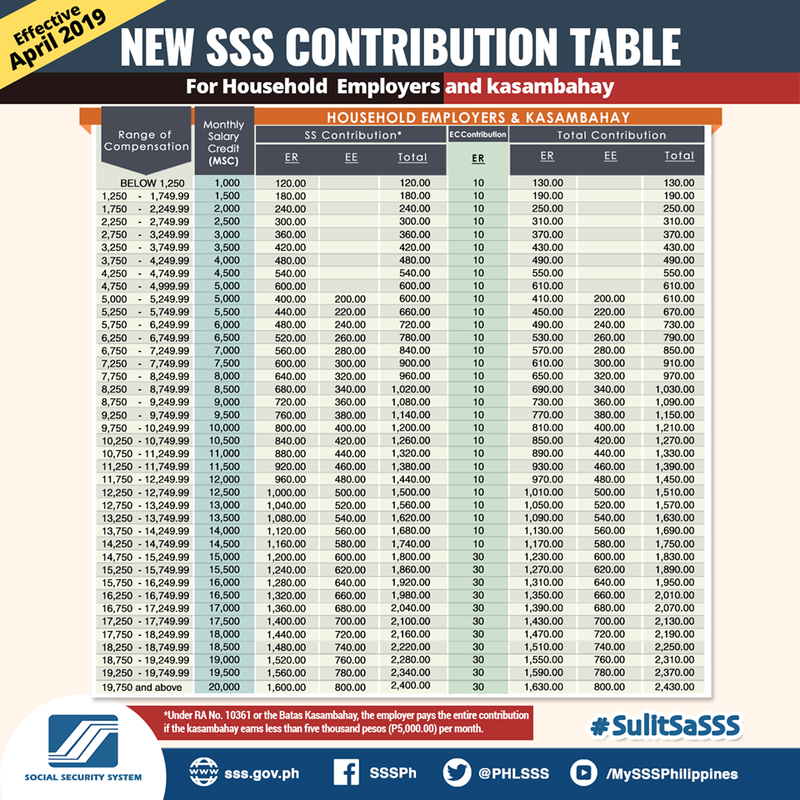 Based on the one-percent SSS contribution increase, if an employee is earning P10,000 a month, his salary deduction for his SSS benefits will now be P400 instead of the previous rate of P363.30. For the employer's share, it's now required to pay P800, instead of the previous rate of P736.70. The employer will also pay P10 for the EC program. A non-working spouse's MSC is equal to half of her spouse's MSC. If a working spouse has an MSC of P20,000, then the non-working spouse's MSC is P10,000. A non-working spouse and a self-employed individual will pay in full for their SSS contribution. Under Republic Act No. 10361, or more popularly known as Batas Kasambahay Law or Domestic Workers Act on 2013, the household employer is required to pay her employee's SSS contribution in full if the kasambahay earns a salary below P5,000. If your helper's basic salary is P4,500, you need to shoulder her SSS premium in full, which is P540. If your helper's salary is P8,000, you will pay SSS P650 while your helper will shoulder P320. As the employer, you will have to pay the P10 allotted for the EC program. An OFW's minimum MSC, on the other hand, is now at a minimum of P8,000 from the previous P5,000. 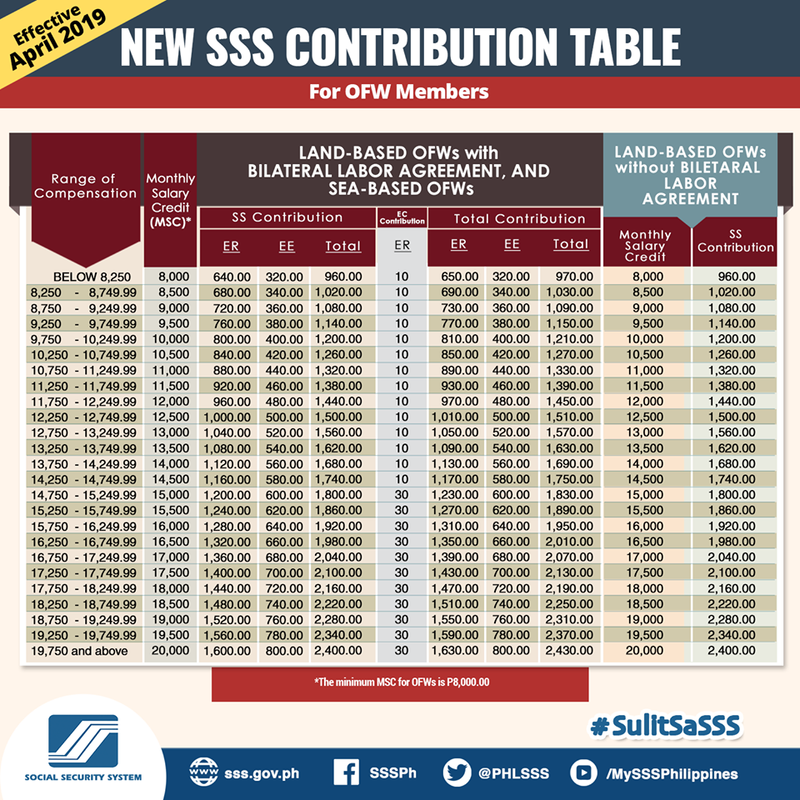 OFWs will pay for only a fraction of their total SSS contribution because their employers will shoulder the remaining amount, plus the P10 EC contribution. For better resolution, right click on the images above and choose 'open image in new tab' or download the complete 2019 New SSS Contribution Payments here. This story originally appeared on Smartparenting.com.ph. Minor edits have been made by the editors.